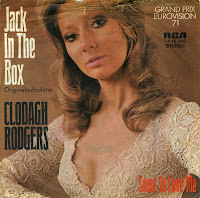 Clodagh Rodgers was born on March 5, 1947 in Northern Ireland. In 1970 she was asked to represent the United Kingdom in the 1971 Eurovision Song Contest. Part of the reasoning behind the BBC's invitation was their concern over what reaction the UK entrant would get on the stage from the Irish public. She received death threats from the I.R.A. as a result of her appearing for the UK. The singer expresses her strong feelings of love to a man who treats her like a toy. She feels that in exchange of his love, she would gladly 'bounce on a spring' like the aforementioned toy. After ending fourth in the Contest, the song coincidentally also peaked at number 4 in the UK singles chart.